Originally acquired from Christchurch dealer Ernest & Hines this immaculate 1915 Indian underscores why this marquee more than any other were so successful for the most part of 20th century. The overall aesthetic is both refined and purposeful. The balance between function and form is duly meet with great success. The detailing is exposed allowing the rider to constantly audit the machine to their pleasure. The solid state twist grip linkages are pure genius providing positive tuning for the intrepid pilot. 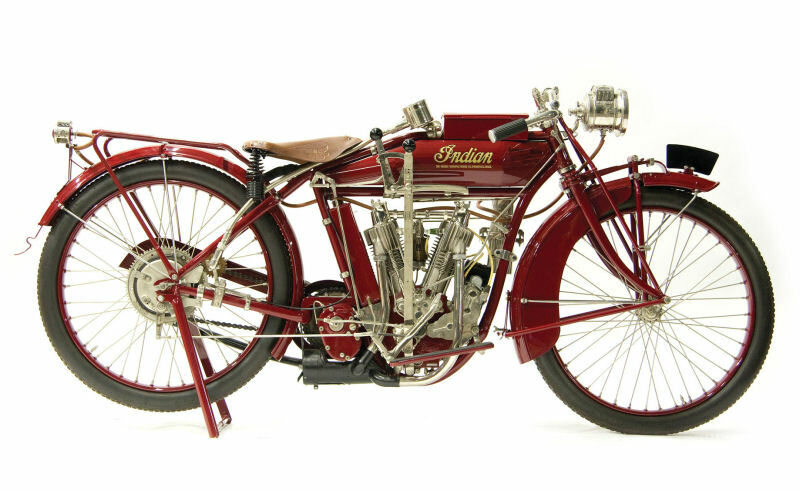 Introduced in 1904 the lush deep Indian red is as iconic as the wonderful V-Twin configuration that Indian was first to introduce in America. Rare, the 680cc light twin was somewhat of a radical departure from the big V-twins which had already established a good reputation. Offering light smooth and efficent power delivery they were produced in small numbers with the British market acquiring the lions share of these aggressive looking machines. Wonderfully cared for over the years this machine comes with a full local history.